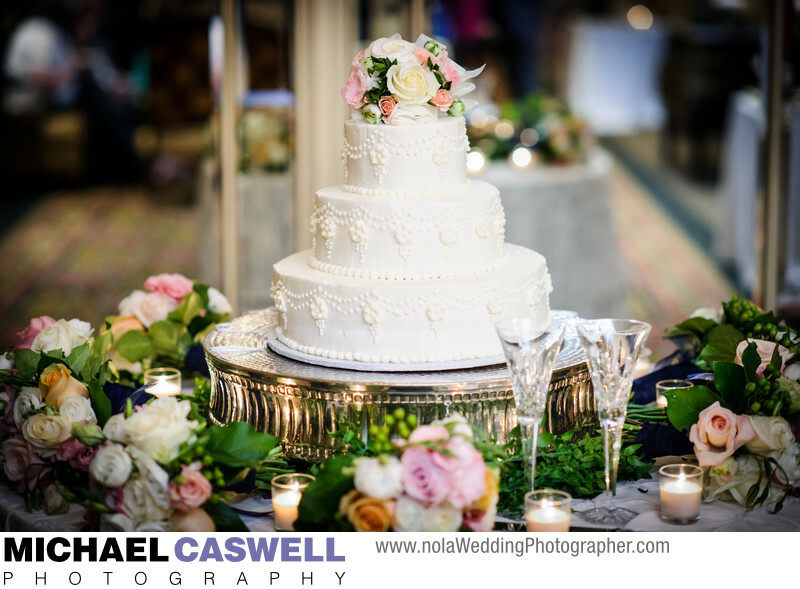 Maurice French Pastries in New Orleans created this delectable wedding cake for this celebration in Grand Ballroom of the Omni Royal Orleans Hotel. The gorgeous flowers that adorn the cake and table were crafted by Belle Chasse florist Erin Steen, who did a great job with the rest of the decorations as well. The Omni Royal Orleans is an outstanding venue for a wedding ceremony and/or reception, featuring spaces to accommodate both large and small weddings, and a rooftop observation deck that is great for portraits of the bride and groom with the New Orleans skyline in the background.